The Applauze – Concerts, Sports & Theatre Tickets iPhone app is an elegant, exciting, and easy way to find, share, and purchase tickets to great events. You create an account with an email, password, and confirmation, and you are scrolling through upcoming events in seconds. The elegant interface, intuitive gesture controls, and seamless purchase tools make buying tickets almost as fun as the attending the event. The Applauze iPhone app home screen is well-organized and visually engaging with menu bars framing the screen. The menu bar at the top of screen has two icons. The icon on the left leads to a list of all of the cities currently served, so you can change location easily. The icon in the upper right corner gives you access to your account. You enter items like your name, shipping address, phone number, and credit cards. You will also find your receipts and credits listed. Just below the top menu bar, you will find a search bar to manually enter a search. The majority of the screen has a great photo for an event, the name of the event, location, and price. You scroll through the selections with vertical swipes. The photo size of an event expands as it reaches the top of the screen. This smart design move transforms a news feed into a dynamic experience. The menu bar at the bottom of the screen allows you to sort and filter events . With a tap on the all icon, a wheel of categories slides up on to the screen. You swipe in an upside down “u” shape to scroll between music, theater, athletics, and community events. This is extremely cool interface, and it is much more engaging than a simple pop-up list. You can also sort events by nearby, hot, and soon, as well as access your events, with a touch on the other icons at the bottom of the screen. To learn more about an event, you touch it. The picture remains, but additional items are added to the screen. The date and start time are tucked into the upper right hand corner. In the lower right hand corner of the photo, you will find a price. If the price indicates preferred seating, then the price will receive prime status. If a ticket broker is charging too high, you can touch the report price icon on the photo. The Applauze iPhone app team monitors prices to eliminate brokers who are charging unnecessarily high rates. Below the photo, you touch the invite friends icon. A pop-up gives you a list of options – invite via Facebook, SMS, and mail. The interface to invite is simple and complementary to the mode selected. Once you invite friends to an event, a chat room is automatically created for you and your friends to discuss it within the Applauze iPhone app. The next menu bar on the screen gives you a chance to select seats. The interface is impressive with its simplicity. The list of seats is sorted by location and price. For example, you touch balcony and two e-tickets are available for $72 dollars. Or, you touch orchestra right to find 6 tickets are available in Row F for $87 each. You can compare seating locations with a press on the seating chart icon. Details like the dates, times, locations, and a link to maps are shared concisely at the bottom of an event’s screen. At the bottom of an event’s screen, there is a bottom menu bar. In the left corner, you can press the arrow icon to share the event via Twitter, SMS, and email. The bottom right corner gives you a chance to purchase the ticket. You select quantity and payment method, then authorize payment after a confirmation. The process to purchase the ticket is similar to a shopping iOS app–not like battling it out online, entering multiple security codes to get to the next screen, flubbing the security code, and missing out on the tickets to your preferred event. 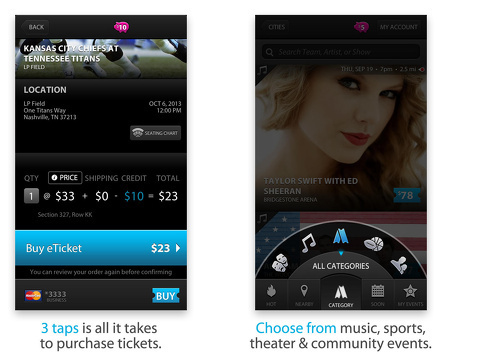 Applauze – Concerts, Sports & Theatre Tickets iPhone app takes the frustration out of online ticket purchase and makes searching and purchasing tickets fun. 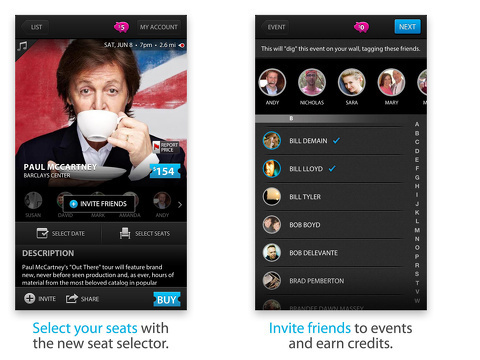 AppSafari review of Applauze – Concerts, Sports & Theatre Tickets was written by Jenni Ward on September 6th, 2013 and categorized under App Store, Events, Free, Music. Page viewed 4641 times, 1 so far today. Need help on using these apps? Please read the Help Page. Don’t not use Applause for concert tickets. Read their Face Book page for comments on the left side of their page.No tickets sent.They tell you to go to the concert to pick them up, via will call, but no tickets at the event . Bad business practice .Just read a review on Paste, says the same thing .Stay Away.